Winterizing gardens can be overwhelming for new gardeners. So, I’ve put together a detailed checklist that you can use for putting your garden to bed for the winter. In this post, you will learn everything you need to know about how to get your garden ready for winter. A friend of mine just bought a new house and she recently asked me “Do you have any tips for winterizing gardens in the fall?” This is a great question and one I get asked often. So I was inspired to share my checklist for putting my garden to bed in the fall. Before you read on or start scrolling down, let me just say that this list is looooong. 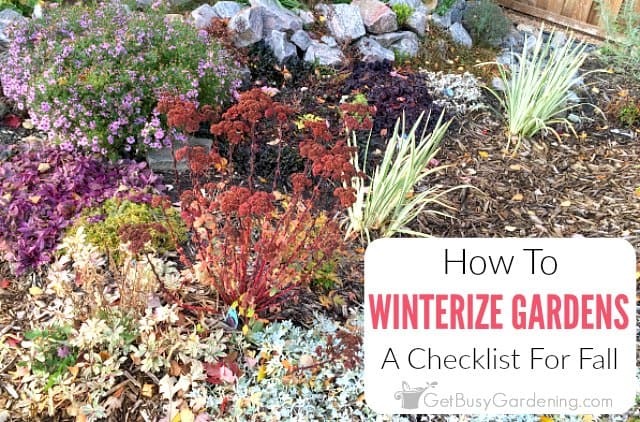 I don’t want to overwhelm you with tons of different ways to winterize your garden! 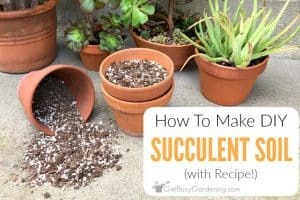 But I’ve included everything here that I always think about for winterizing my gardens. 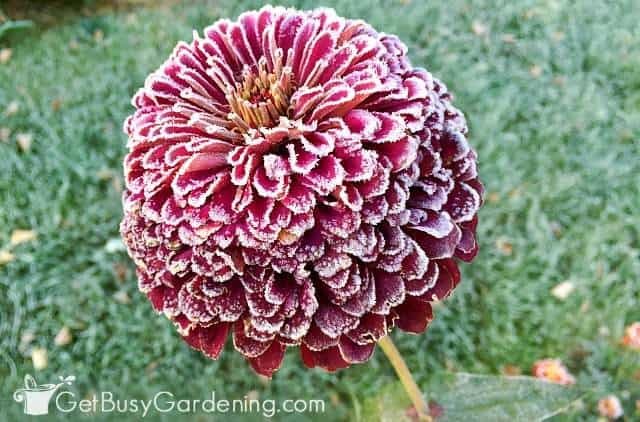 This helps me stay on task and organized while preparing my garden for winter, so that I get as much done as I can. This doesn’t mean that all of this must be done before the snow flies… or most of it really. 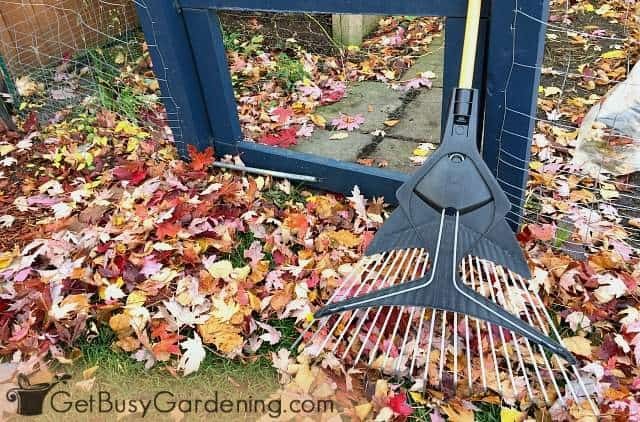 Most of this stuff can wait until spring so if you’re crunched for time, check out my short list of five essential fall gardening tasks instead. 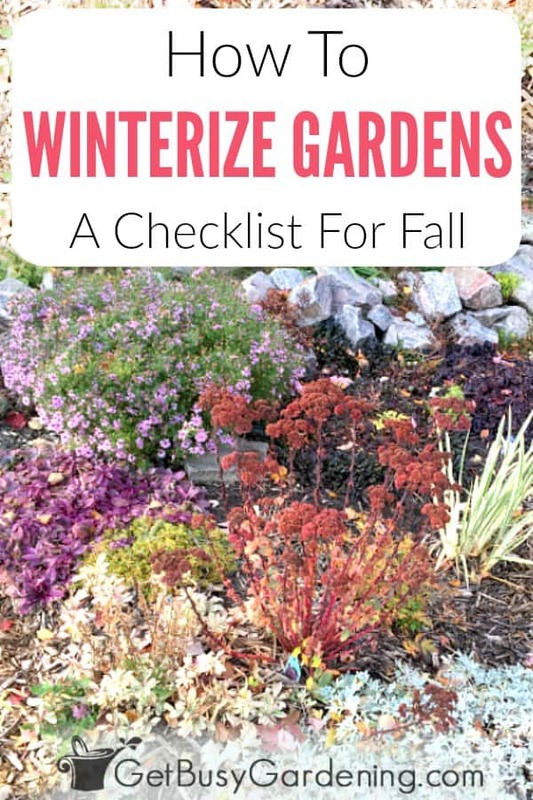 The best time to start winterizing gardens is after the first hard freeze in the fall. A hard freeze occurs when the temperature gets below freezing overnight, killing off tender annual plants and vegetables. Freezing temperatures will also trigger perennial plants to start going dormant, so you know it’s safe to start cutting them back. Of course, you don’t have to start winterizing your gardens right after the first freeze. You can take your time and work on these tasks throughout the fall, all the way through until the snow flies. Let’s start by listing some general tasks for winterizing gardens that apply to any type of garden you have. In this section, you’ll find a list of general things you can do for preparing garden beds for winter. In the next section, I’ll break it down to more detailed steps for winterizing gardens, including perennials, annuals and vegetable beds. Then, I’ll list a few tasks for overwintering plants. Finally, I’ll include a few checklist items for preparing your yard for winter too. Mulching – If you have any tender perennials that will need extra protection during the winter, you can use mulch as a winter garden cover. Leaves, pine needles, and other organic materials are the best mulch for winter protection. To cover plants with leaves for winter, you can simply rake them into the garden bed if you have enough to cover everything. Otherwise, you can just use them to cover specific plants if you’d rather. Watering – It may seem silly to worry about watering plants in the fall when they’re going dormant. But keeping plant well hydrated in the fall is actually a super important step for winterizing gardens, especially if there’s a drought. Watering plants in the fall gives them a much better chance to survive the winter. Amending the soil – Fall is the best time to add soil amendments to your garden beds. Compost is a great amendment for any soil type, and a wonderful way to refresh your soil. But before you add any other soil amendments, be sure to test the soil so you know exactly what it needs. It’s easy to do with a home soil test kit. The steps you take for winterizing gardens depends on the type of gardens you have. Perennials beds need different care than annual flower beds or your vegetable garden. So, below I’ve broken down the steps I take for each of the three types of gardens. The main task you’ll have for winterizing perennial gardens is fall cleanup. 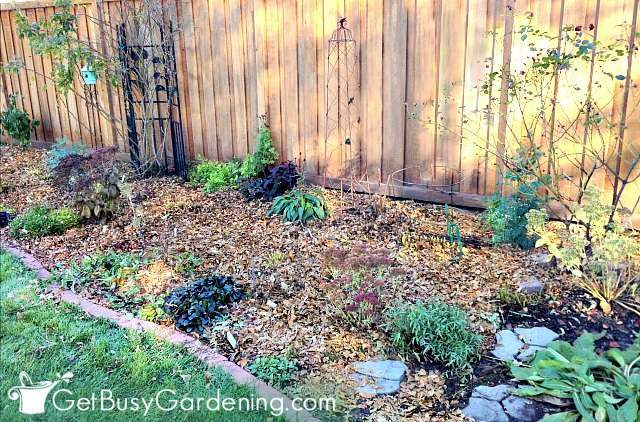 You can completely clean your perennial beds in the fall, or you can just do the bare minimum. Remember, you don’t have to do it all in the fall. There are lots of plants you can safely leave in the garden until spring. Here’s the order in which I work on cleaning my perennial gardens in the fall. Cut back spring blooming perennials – I usually cut back all of my spring blooming perennials (peonies, irises, columbine, dianthus…etc) to the ground in the fall as a minimum. Since they are the first plants to grow in early spring, I don’t have to stress about cleaning them up as soon as the snow melts. But again, these can wait until spring. However, be sure you make time to cut back your irises in the fall! This is the best way to avoid an iris borer infestation next summer. Cut back aggressive self-seeders – Next, I focus on cutting back plants that are aggressive self-seeders (black-eyed Susan and other rudbeckias, liatris, butterfly weed…etc). These plants can sometimes become weeds if they end up seeding themselves everywhere. Cutting them back in the fall saves me hours of weeding out unwanted volunteers every summer. Of course, if you want those volunteers in your garden, then you can take this item off your checklist. Cut back summer perennials… or not – The last thing I do to winterize my perennial garden is to work on cutting down the rest of the summer perennials (lilies, hostas, phlox…etc) if I have time. However, I don’t cut back all of my perennials in the fall because I like to leave some plants for winter interest and food for the birds (cone flowers, sedums, hydrangea…etc). Oh, and here’s a time saving tip for you… using a hedge trimmer or hedge pruning shears to cut down your perennials really speeds things up! 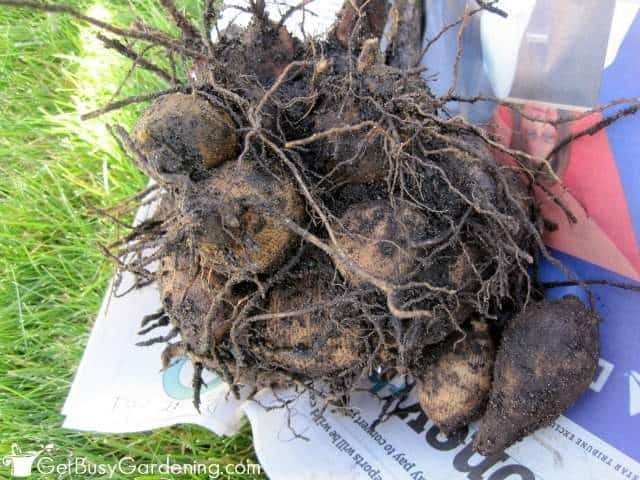 Dig up annual bulbs – I grow tropical bulbs (dahlias, cannas, elephant ears, gladiolas… etc) in my flower beds, so the first thing I do after freezing temperatures have killed off the plants is dig up the bulbs and store them for winter. See below for details about overwintering flower bulbs. Clean out dead annual plants – Once a hard freeze has killed everything in my annual flower beds, I pull all of the plants out by the roots and toss them into the compost bin. Some years I’m too busy to pull them all in the fall, so I’ll clean up the rest in the spring. Don’t worry, there’s no harm in leaving dead annual plants in the garden until spring. Clean out dead vegetable plants – In order to prevent diseases like blight from overwintering on plant material, it’s super important to remove the plants from your vegetable garden in the fall. So, after the first freeze has killed off your garden, be sure to remove all of the dead vegetable plants as your top priority. Destroy diseased plant material – Don’t put any diseased plant material into your compost bin though. Any vegetable plants that had disease issues like blight or powdery mildew should be thrown into the garbage or burned to destroy the pathogens. This is a super important step for safely winterizing gardens, and will help prevent recurring disease outbreaks in your vegetable garden. 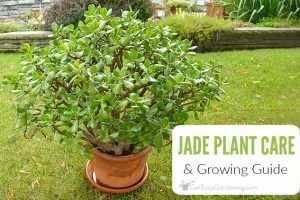 There are tons of different plants that can be brought inside in the fall and grown as houseplants, or dug up and overwintered in their dormant state. You can also easily overwinter cold hardy plants in a garage or shed so they don’t take up space in the house. 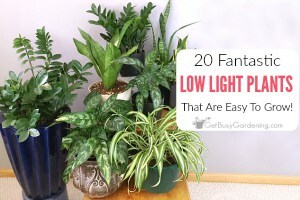 Bring tender plants inside the house – Many types of tropical plants, succulents, and tender perennials can be brought indoors and grown as houseplants. Just be sure to clean and debug them before bringing them indoors. Move cold hardy plants to a protected location – You can also overwinter cold hardy perennials that are growing in pots. Simply move them into an unheated garage or shed to give them extra protection from the cold. Be sure to leave the soil on the dry side all winter so they won’t rot. But check on them a few times during the winter to make sure the soil hasn’t dried out completely. Store your bulbs – After digging up the bulbs from your garden, remove all of the dead foliage and allow them to dry out a bit to prepare them for storage. I pack my bulbs into cardboard boxes, using peat moss or newspaper to keep them from drying out or rotting, and then store them on a shelf in my basement. Move potted bulbs inside – Tender bulbs growing in containers can be overwintered right in their pots. Simply cut off the foliage, and move them to a dark, cool (but above freezing) location for the winter. Sometimes we can get so busy winterizing gardens that we forget about our yard and the lawn. But, preparing your yard for winter is just as important. Here’s a short list of tasks for winterizing your yard to add to your checklist. Some people don’t care as much about the lawn as they do their gardens (raising my hand!). However, there are a few simple lawn winterizing tips to ensure your grass looks its best come spring. Don’t worry, I’ll keep this list short! Rake leaves off the lawn – Allowing leaves to sit on the lawn all winter could leave dead patches in the spring. So it’s important to rake the lawn in the fall to remove all of the leaves. Leaves are great to use as natural mulch for your vegetable garden, around your perennials, or as an addition to the compost bin. 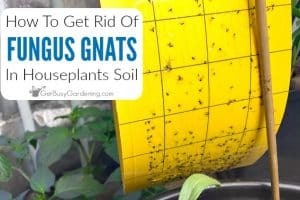 You can also mulch them into the grass using your lawn mower if you don’t want to rake, which adds wonderful nutrients to the grass. Cut the grass short – In the fall as the lawn starts to go dormant, lower your mower blade to give your grass a nice short cut for the winter. Consider bagging the clippings to throw into the compost bin or till into your vegetable garden (as long as you don’t chemically treat your lawn that is!). Fall is also a great time to aerate and dethatch your lawn. Get more lawn mowing tips here. To extend the life of your garden furniture, you should store it in a protected location for the winter. If you leave it sitting outside all winter, it’ll fade or rust, and break down much faster. Put away garden furniture – Storing garden furniture in a garage, shed, attic or basement would be ideal. However, if you don’t have the space, then consider buying protective covers for them. One caveat… if any of your furniture has decorative tile on it, then I highly recommend finding a place for it inside rather than just covering it. Tiles can pop or break in extremely cold climates like mine here in MN, ruining the piece (not that I would know that from experience). If you have a pond, waterfall, bird bath, fountain or any type of irrigation system in your yard or garden, then you need to make it a priority to properly winterize them. Do not skip these checklist items, move them up on your priority list for sure! Empty and store small water features – Small water features, like bird baths and fountains should be emptied and protected to keep water from settling in them. You can get a fountain cover or a birdbath cover to protect them outside, or move them indoors. Winterize garden irrigation systems – Underground sprinklers, drip irrigation systems or sprinklers in an unheated greenhouse should be turned off and blown out for the winter using an air compressor. Garden hoses should be drained and stored in a garage, shed, or other protected location. Winterize garden ponds and waterfalls – In warmer climates, you may be able to leave your pond pump running all winter to keep the water from freezing over. But in extreme climates like mine, you need to turn off the pump, properly winterize your pond and waterfall to prevent severe winter damage, and adding a pond heater if you have plants or fish. Learn exactly how to winterize a pond here. Whew! I told you that winterizing gardens can be a lot of work! Just remember, don’t get overwhelmed. If you can’t get everything done this fall… it will all be waiting for you in the spring! Now that you know how to prepare your garden for winter, you can work to create your own customized checklist to make it easier next year! Share your tips for getting your garden ready for winter, or your checklist for winterizing gardens in the comments section below! Great post! You just about covered it all…I'm not quite done with winterizing all of my gardens, but have to finish soon as snow is in the forecast. Meredehuit – I hear you! It's been a busy fall, and I still have lots to get done in my gardens before winter hits too!! Thanks so much Amy! Your list was pretty comprehensive, and I learned quite a few great tips! I loved the “lasagna method”. It saved me hours of back breaking work. You are right…it IS easier to have a list made out for winterizing my gardens. Kudos to you for doing that for me! You’re welcome, I’m so glad you found it helpful! I love the lasagna method too, it makes things SO MUCH easier!! I actually didn’t find your guide long and overwhelming. In fact, you’ve covered, pretty much, everything about winterizing a garden. After all, your garden can never be too prepared for the colder months ahead. I’m a first timer on a perennial garden this year. We have a beautiful garden with 2 huge maple trees above it. I’m wondering if there’s a way to prevent the leaves from going into the garden because if we leave it the way it is then there will be alot of leaves on the mulch. 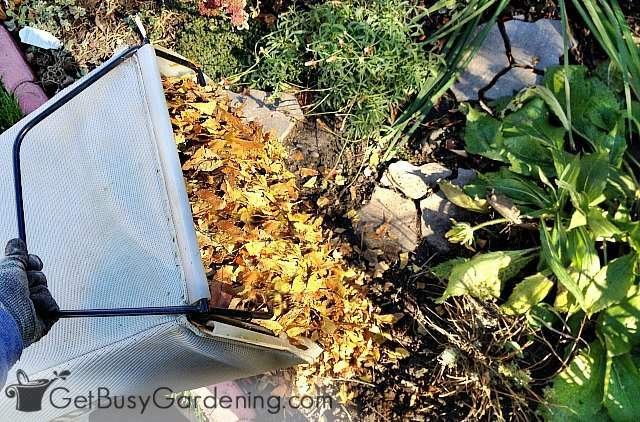 I don’t think there’s any way to prevent the leaves from fall into your garden, unless you want to try covering the whole thing with shade cloth or some other type of cover. But don’t worry, the leaves are good for your garden! They work as a winter mulch to protect the plants, and as they break down they feed the soil. I leave the leaves in my garden all winter (I even rake them into it). If there are still a lot of them in the spring, I will remove them during my spring clean up. You can always freshen the mulch in the spring, and just put it right over top of the leaves.